THE EARTH OPTIMISM ABT: Earth Day is the largest secular holiday in the world, AND since 1970 has presented the bad news of how we are destroying the planet, BUT bad news takes a toll, THEREFORE this year the Smithsonian Institution is presenting The Earth Optimism Summit which shifts the focus of Earth Day to stories of success. That’s been “the narrative” for the environmental movement for over 45 years — since the first Earth Day in 1970. It was needed in the early days to motivate and light the fires needed to defend the planet. But there’s an air of pessimism that inevitably arises from so much grim news. That pessimism eventually saps the life out of even the hardest workers. Two scientists who figured out this problem more than a decade ago are coral reef ecologists Drs. Nancy Knowlton and Jeremy Jackson. I watched their awakening over the course of several years when they were professors of marine biology at Scripps Institution of Oceanography. 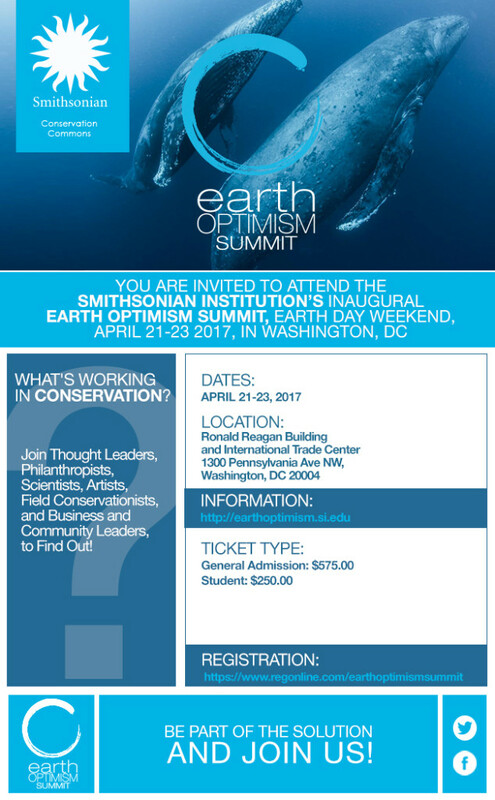 THE EARTH OPTIMISM SUMMIT APRIL 21-23 IN WASHINGTON DC — YOU CAN ATTEND! The plans are now set for a gathering of over 200 conservationists ranging from scientists to economist to lawyers to communications folks to tell stories of conservation success from around the world. I’ll be one of the speakers. And here’s the good news — it’s open to the public for a modest registration fee. Actually, here’s the very best news — the event has a clear narrative. Unlike too many gatherings these days where people don’t really know what they’re trying to say (they’re just angry) this event knows EXACTLY what it has to say. What the organizers and all the participants have for a message is laid out clearly with ABT structure in the subtitle above. In fact, you can even boil it down to a single word, reflecting a clarity of purpose that’s essential for people to dedicate their lives to a mission and remain inspired over time.